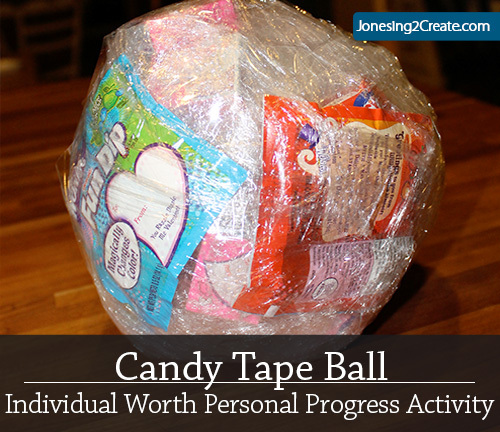 I have always wanted to do a candy tape ball and was excited when I figured how to tie it into an Individual Worth Personal Progress Activity. This would also be a great idea for a family home evening lesson. I printed it out four to a sheet on cardstock paper. I wanted to place the handout in the middle of the ball, so I started with a plastic container with a lid that was big enough to fit the handout in. I then started to wrap a short piece of plastic wrap around the container while periodically sticking a piece of candy under the plastic. Once I was done with that piece of plastic wrap, I wrapped around the ball with packing tape. I then added another player of plastic wrap with candy and then more tape until I ran out of candy. The trick is to keep the pieces of plastic wrap and tape short enough so that they can’t just unwrap the whole ball at once by unrolling it. I tried to maintain a balance between it being too hard or too easy. Using the plastic wrap around the candy allowed me to use candy with foil or paper wrappers without the wrapper sticking to the tape and coming off. I also didn’t have to use quite as much tape. If you put the handout in the middle like I did, you will have to focus on padding some of the sides with more candy than others at first so that it becomes round like a ball. Talk about how we are daughters of Heavenly Father, who knows us and loves us. He feels the same about all his children. Ask the girls how we can love others as the Lord loves us. Discuss how we have to see others the way the Lord sees us. It is important to get to know people as they really are. Do not assume that there is nothing of worth there just because you can’t readily see it. The same goes for yourself. You have gifts that are yet to be discovered. Looking at this ball you can only catch a glimpse what is inside. You have to take time and dig in to really discover what is in there. Share a story about how getting to know somebody better changed the way you saw them. Ask the girls if they have any experiences to share. Challenge the girls to really dig to get to know people this week. Talk about some ways you can do that. Talk about how this will help them see people the way the Lord sees them. After the lesson, pull out the ball and it is time to play! Sit on the floor in a circle and have everybody roll a pair of dice to see who starts. The person with the highest number is first. Hand her the ball and let her start to try to remove as much candy as she can. But she can only use her hands. No teeth, scissors or other tools. At the same time, the person to her left will start to roll the two dice to see if she can get doubles. I brought a pie pan for them to roll into so that the dice wouldn’t go everywhere. Once she gets doubles, she gets the ball and the person to her left starts to roll. The ball keeps moving around the circle from player to player until there isn’t any candy left. Once we got to the middle with the handout, we talked about how the candy ball was like getting to know somebody. It was fun to see some of the parallels the girls made. I then encouraged the girls to continue to do the second part of the Personal Progress Experience on their own. Be sure to follow up! 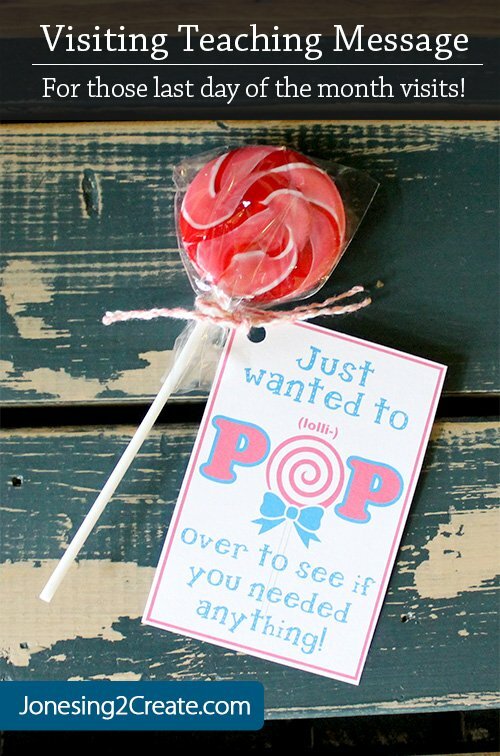 I really like this idea, but I think I might modify it a bit so that the girls make their own with 14 pieces of candy. They can then unwrap the ball a little each day of the two weeks until they get to the “center” and then have completed the experience. This is a great idea!! Do you know how much cling wrap you used? Thanks! I don’t think I used more than a roll of it. You can just buy the cheap stuff at the dollar store, ditto for the packing tape. I don’t think I spent more than $2 to wrap it. Did you use cling wrap or just plastic wrap? How long did it take to unwrap it and how big was your ball overall? I just used the plastic wrap you buy at the store that is used for sealing food containers. I got it at the Dollar store because it was cheaper. The ball took about 15-20 minutes to unwrap and the foot was about a foot tall. How long it takes to unwrap depends a lot on how much tape you use. Hope that helps! You are amazing! I can’t wait to do this!!!! Thank you for this! I did this for my Beehive activity last night and the girls LOVED it! Thank you for this lesson! I’m always struggling with ideas to keep personal progress motivating and this was a perfect lesson to do with my girls. It took waaay longer than I expected to make the ball with 40 little pieces of candy but hopefully it’ll hold up at least 2 rounds and it’ll be worth it. haha Thanks again! Thank you so much. I’m hosting a Beehive activity tomorrow night and am excited to use this idea! Thank you for sharing!!! Such a fun idea! Thank you so much for sharing! I’m doing this for our activity this week. Can’t wait! Thank you so much for sharing the fun idea! I’m doing this for our activity this week and I’m so excited!